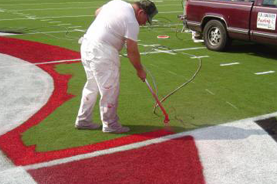 USspecialtycoatings - Field Marking Paints | Traffic Paints | Marking Paints | Industrial Coatings | Protective Coatings | Floor Waxes | Janitorial Products. Our chemists have over 100 years of combined Research & Development, Formulating and Production experience. We invest a lot of time and effort in all our paint formulations. We are proud to state that we manufacture our paints to a superior standard and all our products are made in the USA. We utilize only the finest of raw materials. Optimum quality is ensured with numerous Quality Control tests before, during and after packaging. Our mission is very simple :- To manufacture the BEST PAINT at the BEST PRICE. If for any reason you are not satisfied with our product we will pick-up any unused portion of the shipment and give you a full refund on the unused portion. You have nothing to lose. We will guarantee you the best product at the best price. Our qualified chemists, trained technical and friendly sales staff are here to help.